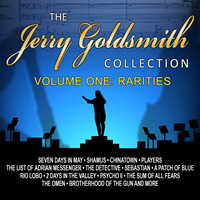 BuySoundtrax Records is proud to announce the release of THE JERRY GOLDSMITH COLLECTION - VOLUME 1: RARITIES digitally beginning May 31st and will also be available at www.buysoundtrax.com and other soundtrack retailers beginning June 19, 2012. The album features ‘new recordings of rarely heard originals, and fresh takes on Goldsmith classics,” as described in the liner notes by noted film music journalist Jon Burlingame. THE JERRY GOLDSMITH COLLECTION - VOLUME 1: RARITIES is now available on iTunes and will soon be available from other digital outlets. THE JERRY GOLDSMITH COLLECTION - VOLUME 1: RARITIES will also be released on compact disc as a limited edition release of 1500 units and will be available from our website and other retailers beginning June 19, 2012.
International customers who are unable to download these tracks from ITUNES US or AMAZON US should refer to your nearest international ITUNES or AMAZON provider to download these titles from.